The 2012 efsli Autumn School will take place in London (UK ) from 23rd to 25th November and is organised in cooperation with SIGNAMIC (UK). 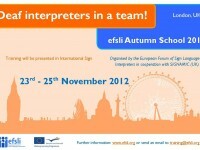 The topic of the 2012 efsli Autumn School is “Deaf Interpreters in a team – Part 2: The next step!”. It is meant to be the follow up of the efsli school held in Prague in 9 – 11 April 2010, Czech Republic. Please download the call for Trainers for the efsli Autumn School 2012. The school topic will be ‘Deaf Interpreters in a team – Part 2: The next step!’ This is to follow up on the efsli Spring school held in Prague in 9 – 11 April 2010, Czech Republic. This training will enable participants to ACTUALLY work with other interpreters (deaf and hearing), learn how to understand each other’s roles, becoming a feeder interpreter, tips on co-working, the dos and the donts, and so on. It will focus on the actual hands-on practical aspects and putting yourselves to the test by doing it for real.